Oh, Georgina! I pity you. NOTE: GFDC has fixed their settings several hours after this article's publication. As a workaround, I looked for that webpage in Google's Cache and saved a permanent snapshot on third party utility Archive.is. I did the same for all the GFDC webpages cited within this article. This way, copies of those pages will be out of the Liberal Party's reach. Last night, my friend Sass Sasot informed me about the existence of a “restricted” Yahoo group called “Global Filipino Diaspora Council” (GFDC) [Yahoo]. CFO Commissioner Jose Molano, Jr.
Judging from this list of very influential people, I now have a better idea why international media acts a certain way against President Duterte. Just look at the list: a billionaire financier, two bureaucrats who have access to overseas grassroots organizations, an Inquirer journalist, an ABS-CBN journalist, and a civil society leader. Now, the chronically negative Western coverage of the Duterte Administration, along with the two Media Blitzes [TP: Mainstream; Plan 0117], suddenly make so much sense now. For example, we all know that the 30 November 2016 anti-Marcos rally had relatively negligible attendance. A real people power requires over 200,000 people, and attendance on that day did not exceed 15,000, probably much less. Despite the failure of the anti-burial rally, it was still reported throughout the world, and I think one of the message threads explain why. Let's look at the 28 November 2016 [GDFC] message thread entitled “5878Re: [globalfildiaspora] dan and jojo, noted and all these groups have copies of this exchange of emails among us and them. thanks Mely Re: To Susan/other egroups, here are the email addresses of those in the US that people can contact re rallies Fwd: These are some suggested PLACARDS for the Nov 30 rally”. Mely, can you request the groups abroad if they can photo document their rallies and send them to you so we release them to local media? Thanks. Who is Mely? It's CFO Chairmain Imelda Nicolas. Another section of the same thread provides us some insight into the size of GFDC's network, as it has people in San Francisco, New York, Chicago. Add that to GDFC's reach in Mainland EU via Sweden's Filomenita Mongaya Høgsholm and Italy's Rowena Sabugo; and the UK via Gene Alcantara and Loline Reed. Yes, if there is a well-organized, well-funded, highly-influential propaganda machinery, this is it. While set as “Restricted”, the group administrator seemingly forgot to make conversations private, and that is how Sass stumbled upon the group's publicly viewable message board, where CFO chairman Imelda Nicolas happens to be the most active contributor. I am pretty certain that no one in GFDC intended the messages to be publicly available, especially since several of these messages are damning not only for their group, but also to embattled Vice-president Leni Robredo [TP: Thief] and the Liberal Party of the Philippines. Okay, I am not a BBM supporter, but it's stupid to blame BBM for being in Balesin when the fact of the matter is that unlike VP Robredo, HE IS NOT A GOVERNMENT OFFICIAL RIGHT NOW. FIRST, that the Office of the Vice-president (OVP) actively manipulates its supporters. Here, we see that no less than the Office of the Vice-president is instructing Robredo's supporters how they would act on social media, even going as far as instructing Leni supporters to denigrate the president just to prop up the VP's problematic image. SECOND, that the Office of the Vice-president's propaganda machine is supported by GFDC, a small group of people who wield great international influence and, by virtue of Loida's inclusion, wealth. I can vividly remember the time when Rappler's Maria Ressa accused Duterte-aligned pages of being a part of some well-oiled PR machinery [TP: Ressa's Pride], when it appears that it actually is the other side that actually has the means to have such a thing. THIRD, that the publicly-funded OVP is using government resources to undermine the government. Who pays for the salary of that OVP personnel who sent that message to Pete Silva. Is it lawful to use government funds for the purpose of undermining the government? This, my friends, is a betrayal of public trust, if not a culpable violation of the Constitution. I have forwarded this email to a few high-profile lawyer-friends for examination. Off the top of my head, however, I believe that this email may constitute Inciting to Sedition [RPC Art. 142], if not Sedition itself [RPC Art. 139], and/or a violation of the Anti-Graft and Corrupt Practices Act [RA 3019 Sec. 3(e)]. While the Vice-president's immunity from suit is still contended, the OVP's social media personnel, which may include OVP Spokesperson Georgina Hernandez, may still be sued in a court of law. This also includes Pete Silva, and GFDC members who participated in disseminating the OVP's controversial email. A deeper look at the message board showed what GFDC's “Sister Act”, Loida Nicolas-Lewis and Imelda Nicolas, have been doing the past several months. Aside from lobbying in the United Nations against the appointment of Philippine Ambassador to the UN Teddy Boy Locsin [GFDC], Loida Nicolas-Lewis has been active in organizing protest actions calling for President Duterte's resignation. The only way to fight this evil Plot to unseat VP Leni is to ask Duterte to Resign. After all, he promised to resign in six months if he has not solved the drug epidemic in the Philippines. He asked for an extension of another six months. A cursory look at the email gives me the impression that while absurd, it is still within legal bounds to issue such a statement. A closer look, however, suggests otherwise. It's clear that Nicolas-Lewis believes that VP Robredo will certainly be unseated if Duterte does not resign, but Nicolas-Lewis is no innocent college activist who would hope against all hopes that the old man will vacate Malacanang. Now, what would you do you're certain that your bet Leni will lose her position, Duterte refuses to resign (ergo stays in power), and you have $600 million at your disposal? Yes, that's one of the reasons why Malacanang accused Nicolas-Lewis of hatching an ouster plot. Malacanang appears to be so certain about its existence that it sent trusted Cabinet Sec. Jess Dureza to the US to meet no less than Nicolas-Lewis herself [GMA]. I think it's clear by now that Duterte will not resign in the foreseeable future. Loida is a billionaire lawyer-businesswoman. She is not stupid. 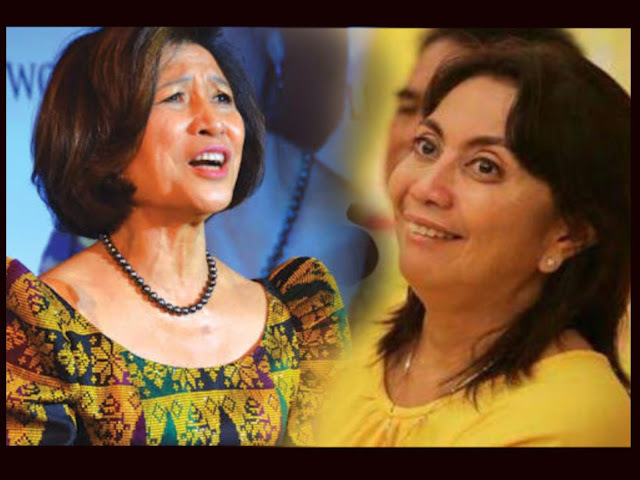 Her initial attempt at calling for Duterte's resignation must have been made for acoustic effect and little else, as it appears that she is actively supporting Leni's election-related cases. Ely, pls call Lilly my exec asst 212-756-8958 and ask her to connect you to me. How do we go about supporting Leni's Legal Defense ? The phone number mentioned in the email is registered under the Reginald Lewis Foundation, named after Loida's late husband [RLF]. Now, Loida is a billionaire, so what else would Leni need from Loida but... ? And isn't it interesting that Leni Robredo visited New York City just last week, in absolute defiance to common sense [TP: White Christmas]? Did Leni and Loida talk about something very important, so important that Leni totally forgot about those in the laylayan? These discoveries fit perfectly to my article “#OustDuterte: Leila, Leni, Lourdes, Loida, LP and Plan 0117”. Yes, LP is likely to have its last hurrah soon. Very soon. Ressa, you have been looking at the wrong place... or was it deliberate?